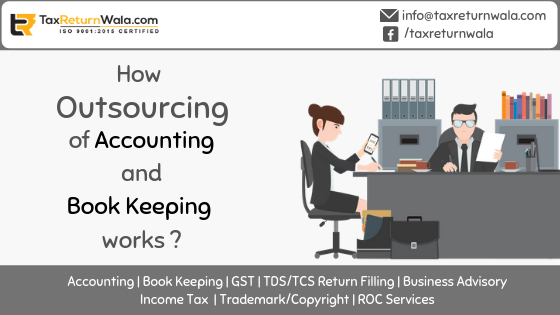 How Outsourcing of Bookkeeping And Accounting Service Works? Get it outsourced! – This is one of the most preferred advice given to any entrepreneur nowadays, who is finding a perfect person to match the accounting needs of his business. When it comes to managing finance and reporting, entrepreneurs need someone who possesses the right skills to prepare their financials, invoices and help them to get their taxation done well on time. While the business culture as observed, says accounting and bookkeeping must be done inside a business, but what if the scenario changes with new compliance procedures – job rotations in such situations would become too annoying. Therefore, a worth considering option for all time is to outsource to an accounting service provider agency. An agency which possess the right knowledge, starring reviews and can do the same job in a more cost-effective way for you. If your decision lies finally on sourcing your key requirements to an accounting service provider agency, the next step is to find and choose the most appropriate agency for your business which matches your needs, goals, and objectives. For outsourcing accounting jobs, something which matters other than the price quotes is the quality of performance and efficiency provided. What are your service needs? : Be clear and precise for jobs you want to outsource, it can be for preparing taxation reports, preparing financials, bookkeeping, audit procedures, payroll etc. What expertise the does company hold? : Make sure you study the company experiences and testimonial reviews well carefully and look out for their reputation in the market. What about Security? : A highly reputed accounting service provider agency keeps all his client records well managed and in privacy – to ensure each of their client transaction remains confidential. What flexibility does it provide in Service level agreements? : The company should be well flexible in making use of all the latest accounting software packages and must be capable of matching your future needs and requirements. It is suggested to check the terms and conditions before signing any contract so that you can terminate the contract in future if not satisfied. Also Read: How can I check my ITR status? Provide access to your financial information: Depending on how you’ve been managing your accounts, you need to provide access to all your accounting information including all keys passwords and additional documents prepared till date. Some common documents will include your payroll details, tax documents, invoices, bills, and related data which your bookkeeper had earlier access to. Be Virtual in Sharing: Make sure you provide a digital format for all your business documents to the agency. There are multiple tools and experts available which can help you to get them encrypted and converted to dematerialized form. If provided an option, you can also share your necessary documents to the agency through other means in offline mode. Define your expectations: Be clear and straight to the point in negotiating your requirements and expectations from the agency I.e. specify them your plans, thoughts, and things you want to get done from your agency. Also, state how you want things to be reported monthly or weekly. Provide a Sequence: Every agency needs a proper sequence of compliances to be followed during the course of association, the bookkeeper so put to work by the agency should be made clear of the persons or ways he can contact in case, any query ramp up. Request communication and reports: It is especially important to be in touch with the person specified by the agency for timely reporting. The key to success of a perfect association with an accounting service provider agency is communication, it does not matter whether the bookkeeper is few miles or seven states away from you, effective communication and strong relation with the associates always brings a win-win situation. Hiring an accounting service provider agency seems an impossible task, but as you read above it’s all very easy, to begin with. All you get in return is expertise, excellence, and efficiency in operations.